Kurt Schwitters – Artist or Madman? I blame Woman Walking Slowly for my current interest in collage. Yesterday’s Daily Telegraph had an article about Kurt Schwitters, who has an exhibition coming up at Tate Britain starting on January 30th. 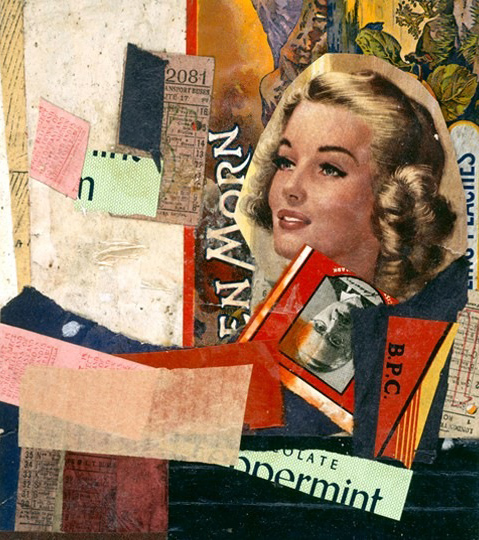 The item was illustrated with one of his collages, “En Morn” from 1947. “… If Schwitters is now established as one of the 20th century greats, he is nevertheless a peculiarly difficult figure to pin down. He is hailed as the godfather of everything from Happenings and Fluxus to performance art, conceptual art and multimedia art, claimed as a central influence by artists of the stature of Robert Rauschenburg, Damien Hirst and Ed Ruscha. A big, ebullient and hugely eccentric character …. Schwitters doesn’t quite fit with any of the established currents of 20th century art. … “He was involved with many movements and groups, but he was always slightly out on a limb,” says Karin Orchard, curator of Hannover’s Sprengel Museum, which houses the largest collection of Schwitter’s work …..
“Born in1887 into a well-off middle-class family, Schwitters’ first works were painfully conventional. He studied at the esteemed Dresden Academy alongside George Grosz and Otto Dix …. It took the First World War, in which he served as a draftsman, to break him out of his narrow, cosy, provincial shell. “As if to make up for lost time, Schwitters, who was already 30, went through every extant Modernist style – Post-Impressionism, Cubism, Futurism, Expressionism – in the course of a year… His attempts to join [Berlin’s] Dadaist group were rebuffed …. “Schwitters responded by starting his own movement, a movement of one he called Merz, from a fragment of the stationery of the Commerz Bank that appears in one of his early collages …. “Collage had been pioneered by Picasso and his fellow cubists early in the century, but Schwitters’s approach was more all-embracing than anything that had gone before. For him there was no substance that was off limits to art. His wife recalled having to wait for him in the street one night as he began to create a collage from cigarette ends and other detritus…. “Schwitters’s work featured prominently in the Nazis’ anti-Modernist ‘Degenerate Art’ show. 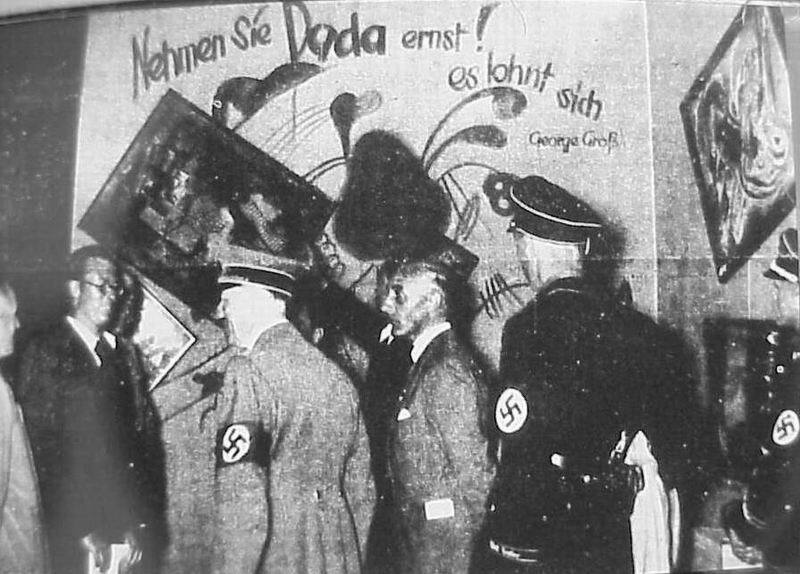 The best-known photograph of the exhibition shows Hitler laughing at one of Schwitters’s works. “Wanted for an ‘interview’ with the Gestapo, Schwitters fled to Norway where he had a holiday home, in 1937. On the country’s annexation by Germany in 1940, he took the last boat out, arriving in Scotland, carrying little luggage, but with a white mouse in each pocket. Interned as an enemy alien, he eventually found himself in the Hutchinson Camp on the Isle of Man. Crowded into three fenced-off streets of boarding houses in the Manx capital Douglas, the camp’s inmates included 32 university professors, various eminent musicians and the chess correspondent of the New Statesman…. “Schwitters engaged in furious nightly barked conversations with another internee, an elderly Viennese businessman. While the latter had a deep mastiff-like bark, Schwitters’s woof, one observer recalled, was higher-pitched, like a dachshund’s – all of which seems to have been accepted as a part of the rich tapestry of camp life. “When Schwitters was released after 18 months, his long-anticipated move to London was an anticlimax …. but at his lodgings in Barnes, west London, he met the love of the latter part of his life, Edith Thomas… He called her Wantee, because she was always offering tea. “Schwitters was the subject of major exhibitions in America within years of his death, and his reputation revived steadily in Germany from the mid-Fifties onwards. But despite the enthusiasm of British artists, notably Richard Hamilton, … Britain seems to have been the last place to acknowledge Schwitters’s importance. And nowhere in Britain seems to have been more indifferent to the artist than his adopted home, the Lake District. This entry was posted in Art, Art Gallery, Artists, Collage, exhibition, Painting and tagged art, artist, collage, kurt schwitters, lake district, merz, schwitters, Tate Britain. Bookmark the permalink. 10 Responses to Kurt Schwitters – Artist or Madman? You’re welcome! I just wish the Telegraph website had articles from the various supplements and magazines. Great post, John. So interesting – I had no idea he’d become a British citizen. Wonderful artist – I’m looking forward to the show now. Sad he was only a British citizen for one day. I’m also hoping to catch the show next month. We’re having a couple of days in London on the way back from a week’s holiday in Moscow and St Petersburg (Hermitage, yeah!). Manet at the RA and the Moghuls at the British Library are further up the list though. Mea culpa! Your post is timely – am off to Hanover soon so will try to fit in a visit to the Sprengel although if there is an exhibition coming up in the Tate maybe I should wait until it is over and Schwitters’ work goes back to Hanover! I’ve recently become interested in Willi Baumeister’s collages and mean to do a post when time permits. Thank you also for the blog mention. I’ll be heaping more blame on your head in the near future as I post some screenprint experiments I’ve done recently. I look forward to the screenprints. BTW did you know that the Sketchbook Project now has a global print exchange. The $50 entry fee put me off! There’s another with a $10 fee which I’m looking at.